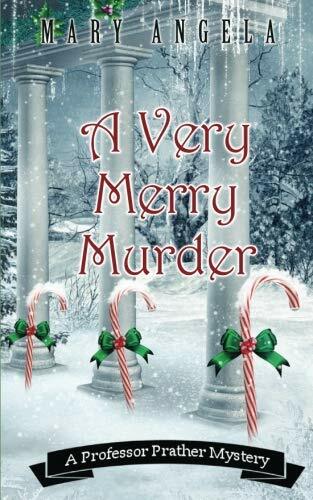 Welcome to Copper Bluff, South Dakota, and its college, setting for Mary Angela’s third Professor Prather Mystery A Very Merry Murder. Cozy mystery fans will love the small town scene and protagonist—spirited, clever, and very human professor Emmeline (Em) Prather. Anyone who hasn’t read the first books will have no trouble starting the series with this one. From the opening paragraph Angela puts her readers in a jolly holiday mood with tinsel, aroma of sugar cookies in the oven, and Dean Martin crooning “White Christmas.” More holiday music awaits Em as she drives out of town into the prairie where darkness covers the landscape “like spilled ink.” A Detroit transplant, she’s relieved to finally spot holiday lights of the lovely Candlelight Inn, home to the visiting Jazz Underground musicians for a few days. Em returns to the inn the next morning with broad-shouldered, blond Lenny Jenkins, her colleague and uncertain lover, for breakfast with the musicians. But the holiday mood turns black when Jazz Underground’s lead bass player Miles Jamison dies at Em’s feet in the front parlor. Miles is on the floor because she shoved him when he tried to seduce her. That, of course, makes her suspect number one. When Jamison’s death is declared suspicious, it’s up to amateur sleuth Em, with Lenny’s help, to find out who killed the musician and why. Red herrings abound like twinkling lights. Is the actual killer drummer Josh, sole beneficiary of Jamison’s insurance? Or maybe it’s Department of Music Chair Tad who now gets credit for the song he published with Jamison? Perhaps it’s Jamison’s grad student Kim who too quickly accused Em of killing her mentor? A professor in South Dakota’s university system, Angela nicely weaves her first-hand experience with college life into the story. Emmeline complains about lesson plans, endless papers that need to be graded, the hierarchy and uncertainty of tenure, the long road to publication, and dealing with students who care little about courses they are required to take. English professor Prather’s frequent references to writing and literary characters are a particular delight. When Lenny accuses her of taking ten minutes to write a check in the grocery store, she’s quick to respond that “penmanship is an important skill.” After claiming that “most answers can be found in a book,” Em eventually does identify the murder weapon in a story she’s assigned her “Crime and Passion” class. Em exposes her most vulnerable self with roller-coaster feelings for Lenny that run throughout the story. When next-door neighbor Mrs. Gunderson refers to him as Em’s boyfriend, Em is quick to say they are “just colleagues.” To that Gunderson adds she’d already been married a decade when she reached Em’s venerable age of 29. At the Candlelight Inn when musician Barbie-doll Belle flirts with Lenny, Em tries to convince herself that she could “care less how long her legs are or how blonde” the young musician’s hair is. Mystery enthusiasts will have to read the novel to find out if Lenny and Em do finally kiss under the mistletoe.